Flex Glue Review: Waterproof Adhesive? Flex Glue is a strong rubberized adhesive and sealant that can repair almost anything. Does it really work? Here is my Flex Glue review. Flex Glue is a powerful waterproof adhesive that can be used to seal or fix nearly anything. 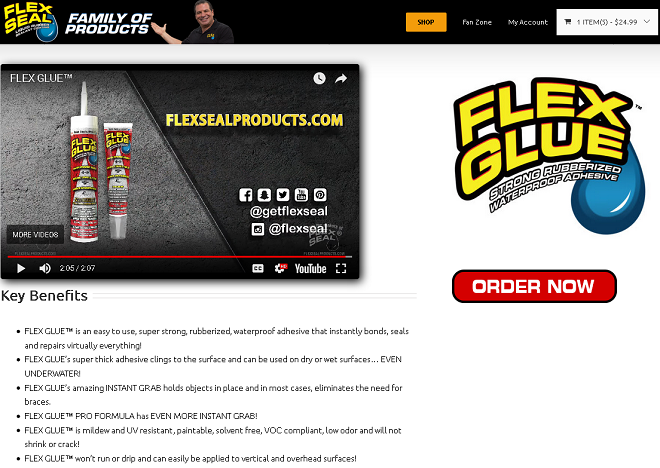 The official product website is flexsealproducts.com/products/flex-glue/, which was registered in December 2014. The screenshot below shows how the product website looked in January 2018. 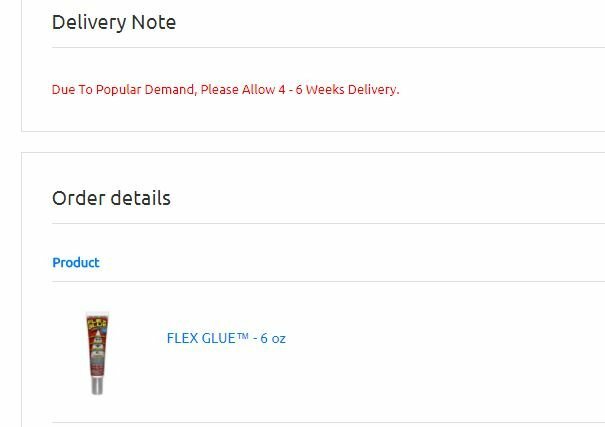 A 6 oz squeeze tube of Flex Glue costs $19.99 + $6.08 shipping + $1.20 estimated tax for a total of $27.27. The tube covers around 30 linear feet. A 10 oz (Pro Formula) cartridge of Flex Glue costs $24.99 + $6.08 shipping + $1.50 estimated tax for a total of $32.57. The cartridge covers around 50 linear feet. For those looking for a hands-on review of Flex Glue, you will be hard-pressed to find one as of January 2018. All of the other review sites out there have all published reviews sight-unseen. Unlike them, however, I will eventually use this product first-hand and update this page when that happens. The reason I post a preview like this is to stake claim my space in Google rankings until I can give it a proper review. It an unfortunate reality of the how the web works these days. Be rest assured, however, that unlike other review sites I will have a first-hand demonstration as soon as Flex Glue arrives. Until then, here are my initial thoughts on the product. Phil Swift, the pitchman who is a darling of the internet, is back again with yet another Flex family product, this time called Flex Glue. You certainly remember some of the infamous commercials for Flex Seal and Flex Tape, and now we have an off-road vehicle which has been glued together and taken for a test run in the company’s latest campy commercial. The commercial for Flex Glue shows it being used to instantly hold together two bricks or cinder blocks. It is said to be a powerful rubberized adhesive that instantly bonds and can even be used underwater. Aren’t Flex Tape and Flex Seal already rubberized adhesives? I guess they’ll keep going to the well as long as these products sell. Although the commercials show it working instantly, it is said to cure over 48 hours and can take a full week for maximum hold. We are told that this can replace screws or nails, and may be used for virtually any type of repair. To use Flex Glue, you must clean the surfaces you want to bond, then apply liberally. After applying pressure for 10-30 seconds, the bond should be in place, although it won’t be fully cured for about a week. You can tool or reposition Flex Glue for about 10 minutes before it will be too cured to manipulate. It doesn’t dry or crack, and can be painted over once dry. Flex Glue can withstand temperatures from -40F to 200F. Keep in mind that once Flex Glue has dried, it can’t be removed without damaging surfaces. It will be interesting to see how well this one holds up to scrutiny. Flex Seal has performed pretty well for most consumers, but Flex Tape has received more mixed reviews. I think that the advertising for these products tends to go too far in raising expectations beyond where they can actually perform. Perhaps they have to do this in order to sell units, but that ends up giving consumers who push the limits a bad taste in their mouths. For now, I’ll be cautiously optimistic that Flex Glue lands closer to the satisfaction rating of Flex Seal than Flex Tape. I have ordered the product, but it will take 4-6 weeks to arrive, as you can see in the screenshot below. I found it rather “convenient” that I wasn’t notified of this delay until after I placed my order. Had I known about it, I probably wouldn’t have bothered. As stated above, these are just my preliminary thoughts on Flex Glue until my product arrives. When that happens, I’ll update this space with a full review. If there are things you’d like me to test out, leave a comment here, tweet me, or find me on Facebook. Other than caulk, I haven’t seen another glue that resembles Flex Glue. For small jobs, however, you still can’t go wrong with Gorilla Glue. Below you can find a couple of related videos from my YouTube channel. First is Flex Tape, by the same company that produces Flex Glue. Below that is my video for 5 Second Fix, another As Seen on TV glue alternative. Have you used Flex Glue or something like it? Leave a comment below and a star rating above to let us know your thoughts. Turbo Heat 360 Review: Does it Work?